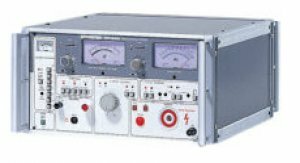 The GPI-625 is a simple 2-in-1 (AC Withstanding / Insulation Resistance) analog safety tester geared toward accurate hazard-free automatic testing. Auto testing can be set to run withstanding and insulation resistance testing in any preferred order. The optional GHT-106R remote controller can be used to remotely run the timer and tests. The GPI-625 has dedicated input/output terminals and a current monitor terminal for external device monitoring. Equipped with a large 500VA AC capacity, the GPI-625 is ideal in a test & analysis environment for testing electronic equipment, components, and insulation materials.